Regarding the plausibility of extraterrestrial life, it was renowned science fiction writer Arthur C. Clarke who once remarked: "Two possibilities exist. Either we are alone in the Universe or we are not. Both are equally terrifying". This is, of course, true. But think about the first option. When you consider the size of the observable Universe - just the bit we can see - with its billions and billions of galaxies each containing billions and billions of stars, are we really saying that intelligent life has never evolved on any other planet orbiting one of these stars and we are, in fact, unique? It's not likely, is it? It has long been known that there's nothing special about us or our place in the Universe. We live on an average planet orbiting an average Sun situated about halfway out from the centre of an average galaxy. So why should we, as a form of life, be anything special either? Before we go any further, let's consider the fact that extraterrestrial life may have already been discovered! Here we see a section of a Martian meteorite, viewed under an electron microscope. 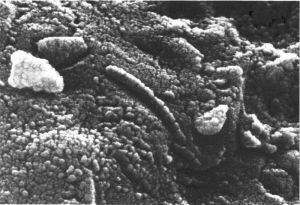 Those worm-like shapes may be fossilized remains of alien microbes or bacteria. But microscopic worms aren't what we want to bother with when considering alien life. No, we're thinking of highly-evolved, intelligent species, the sort that, in sci-fi blockbusters, turn up in space ships and either attack the Earth or interact peacefully with us humans. 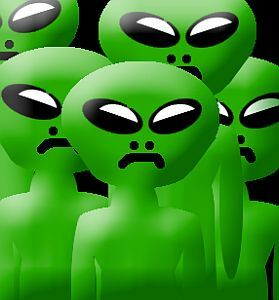 But, what are the chances of evolution of life elsewhere in the Universe resulting in aliens that are "humanoid" in appearance? That and more we'll be considering in depth on the pages linked to below. A look at the possibility of the existence of intelligent alien life, including the famous "Drake equation". Will Intelligent Aliens Be Humanoid? Nearly all science fiction "monsters", however ugly they may look, are still depicted as possessing a body, head and limbs. Is this the optimum arrangement, or are there alternatives? What sort of environment and planetary conditions are needed for the development of advanced, intelligent beings? How might aliens try to contact us? What would the implications be for humanity? Are we sending out our own messages?